[London, 22 September 2016] The managed services industry is in a very healthy state, but acknowledged the challenges as it evolves further. Not least of these is how it finds the resources to support continuing growth, and establish the new language of sales based on business change rather than technology. Two hundred MSPs heard a series of expert presenters at the Managed Services and Hosting Summit 2016 in London on September 21 point to the coming period of change. Mark Paine – Research Director at Gartner talked about a global MSP business of $256bn with over 100,000 MSPs globally competing in the marketplace. But he also highlighted research which showed that the managed services model could mean a dramatic fall in consulting business for IT companies, as well as less training. For customers this means a financial gain, but MSPs must get used to selling more services to compensate. Pulling in figures from Gartner’s own survey of CIOs, he revealed that over two-thirds of enterprise customers plan to review and change their IT sourcing in the next two years, so competition is not going to get less. It all means working far more closely with customers, Tiffani Bova of Salesforce.com had earlier told the audience. “Only technology can help customers get where they want to go,” she explained and this meant MSPs being able to understand the markets and models better: “We need to get to the future before our customers do and welcome them when they arrive.” The customer should always be your “true north”, she explained and that customer experience is where the next sales battle will happen. There was no longer any separation in technology terms between B2B and B2C. For many in the audience, the interest was in learning how other MSPs successfully built their sales and business models; it was all about getting scale, and using expertise in the right places. MSP BlueChip’s MD Brian Meredith came on stage to relate how his business was growing, working with backup specialist Falconstor, and that knowledge of the solutions at a business level was key “The role of MSP is to also lead customers into what is possible,” agreed Tony Martin, Falconstor UK&I MD. Dave Sobel, an entertaining speaker in previous years at this event and Senior Director of the Partner Community at LOGICnow – now part of SolarWinds MSP, who had run and then sold his previous MSP business, related how, in his experience, the most successful MSPs are those that standardise and roll out policies which work for 95% customers. APC by Schneider Electric used the event to launch its new channel programme for MSPs – the first time the company had planned new offerings starting with channel discussions rather than new hardware, Maeve Fox, global channel strategy manager revealed in a busy session. It now has plans to continue to roll-out further systems to allow the MSP to take wider control of features around power and cooling, allowing the introduction of planned maintenance. There were plenty of new opportunities for MSPs revealed on the day: disaster recovery as a service set to grow ten times in next four years- StorageCraft’s European Marketing Director Ellen Marie Hickey told the meeting, and this can represent a new business stream worth millions to the average MSP. Looking forward again, international standardisation body onem2m’s Ultan Mulligan said how, with other groups, it is working on one common IoT layer but diversity and different technologies means that the many devices expected to be used, and around which MSPs are starting to build applications, are working different ways- “things will get worse before they get better,” he warned, but advised the MSPs where to look for advice. In an unusual step, the event brought in the Open University, which has very close links to the UK government cybersecurity initiatives whose new business head, Simon Tindall was able to point to the high level (£1.2bn) of funding support promised for cybersecurity training, some of which is starting to come through in to the industry. In a sector where skills are in very short supply, he pointed to courses, many of them free, which were turning out thousands with some level of expertise which the industry could build on. OU cybersecurity training courses can be licensed, added to and resold, he told an interested session. The Managed Services and Hosting Summit is jointly staged by IT Europa and Angel Business Communications and moves on next to Europe, where a similar event in Amsterdam (www.mshsummit.com/amsterdam) on December 7 will put a European perspective on all these changes. 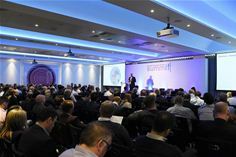 Sponsors of the UK event included: FalconStor, LOGICnow – now part of SolarWinds MSP, Schneider Electric, Autotask, Brocade, ConnectWise, Corero, ESET, Equinix, Ingram Micro, Kaseya, Aegis Data, Coservit, Datto, Deltek, Digital Realty, Exponential-e, InfraScale, Intronis/Barracuda, LogicMonitor, Mimecast, Radware, RapidFireTools, RingCentral, StorageCraft, Uniprint, Virtus, Volta, Webroot and WellData.